1. To increase the athletic brand of the conference. 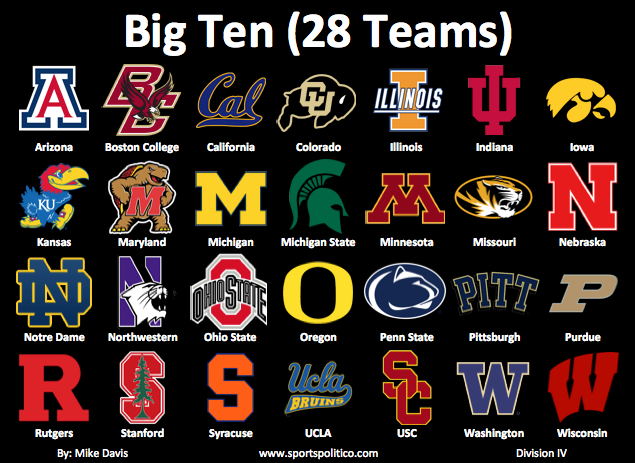 The Big Ten has struggled athletically in a number of sports in the eyes of public perception for the past decade. Giving the conference a new “born again” athletic identity particularity in football was my biggest objective. 2. Keep the Big Ten philosophy of committing to strong academics particularly in the field of research. Every addition had to be justifiable academically in some way. 3. Bring back as many historical rivalries as possible that have since been discontinued. Turn any out of conference (OOC) rivalries the conference has into in-conference rivalries. I started in the West with the four California schools (Cali-4) from the Pac-12 (USC, UCLA, Cal, and Stanford). I choose these four because no other group of schools that are available for Big Ten expansion have a better combination of academics and athletics. It is highly unlikely that these four schools would leave without Washington; a school with a similar academic/athletic profile. After these five I targeted Colorado to complete the raid of the academic core of the Pac-12, but also because they are a terrific partner school for Nebraska. Next I turned to Notre Dame, which is the biggest prize for the Big Ten (I am saving Texas for the SEC). Would the Irish join the Big Ten (20 teams) under these circumstances? The answer is probable, but not certain. At this point the Big Ten has control over a number of Notre Dame (ND) rivalries including one of the most popular among the fanbase (USC). But to truly encourage ND into joining the conference (if not force them in) I added Pittsburgh (Pitt) and Boston College (BC). This would give the Big Ten seven of Notre Dame’s major rivalries (Stanford, USC, Purdue, Michigan, Michigan State, BC, & Pitt) which would effectively guarantee the Irish finally give up their independence. However doing this caused two problems. The first was that I had compromised one of my goals by adding two non-AAU schools with little emphasis on research (BC & ND). The second problem is the lack of a true partner school for BC. I solved this second problem by adding Syracuse, the historic rival of BC. While SU provided an athletic program with historical ties to BC, Pitt, and Penn State, they have the academic profile of ND and BC which only further enhanced problem number one. While I wanted to keep the conference researched focused, there was absolutely no way I was not going to add ND because of their fanbase and athletics. If they were going to be added, I might as well add two other schools with a similar academic profile and keep ND from being a cultural outlier. All three schools have terrific academic name brands associated with them. So while I failed to keep the conference 100% research oriented, I had kept its academic standards of quality academic additions intact. This left the Big Ten as a 24-team conference and I was perfectly happy to stop there, however I went over budget on the SEC and built that conference to 28 teams while kicking out Missouri so determined it would be best to find four more schools to balance out the Big Ten with the SEC. In this model the Big Ten and SEC would be the most prestigious conferences and any other conference would be considered a downgrade. I did not want to downgrade Missouri so I gave them the 25th slot in the Big Ten while giving their rival Kansas the 26th slot. This left two open slots with three quality schools competing for those spots. Arizona: This athletic program had elite level basketball while possessing a very strong basketball program. They also were the best academic program and had academics that were in the middle of the pack for Big Ten standards. They also share a strong bond with USC/UCLA and those schools have lobbied hard for the Arizona schools in the past. I found it very hard to imagine USC/UCLA not using all their cards to get at least one school from the state into the conference. The one downside for Arizona is the lack of a partner school. Arizona State and the Big Ten is not going to happen which meant the Wildcats would be joining the conference not only alone, but located in a region that did not have an abundance of Big Ten schools. Oregon: They are a rare case of a football program that has the resources, fanbase, and athletic relevance of any elite program, but no historical athletic success to warrant it. Not going to say why (Nike) or name names (Phil Knight) but they are a major football power that’s here to stay despite their lack of national championships and being 40th on the all-time wins list. They also help an extremely isolated Washington while giving the Huskies a natural conference rival. The downside to Oregon is academics. Academically they are well below Big Ten standards, however they are a flagship AAU school with an elite level football program which is enough to give them consideration. Iowa State: The benefits of the Cyclone’s was having an in-state rivalry with Iowa while being a former conference member of four other Big Ten additions (Nebraska, Colorado, Kansas, & Missouri). They also have a decent wrestling program which was the one non revenue sports I was factoring into consideration because so many Big Ten schools play it. It was a hard decision between these three, but I ended up going Pac heavy with Arizona and Oregon because they had a stronger academic/athletic combination than Iowa State. 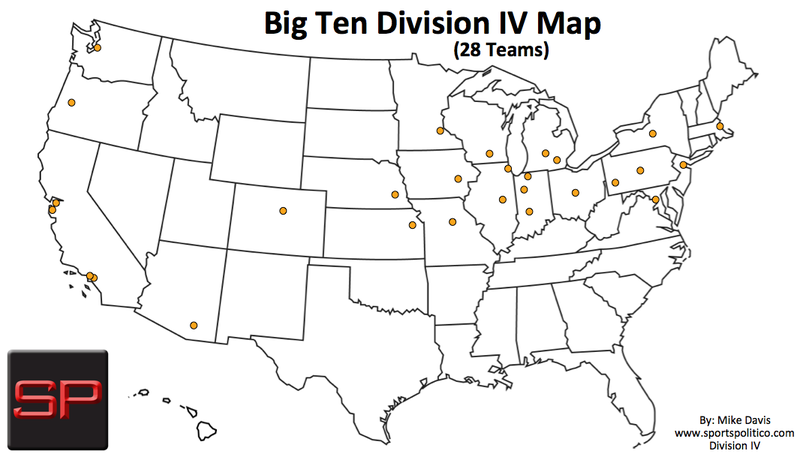 They also made more sense geographically as they provide closer conference games for schools such as USC and Cal.